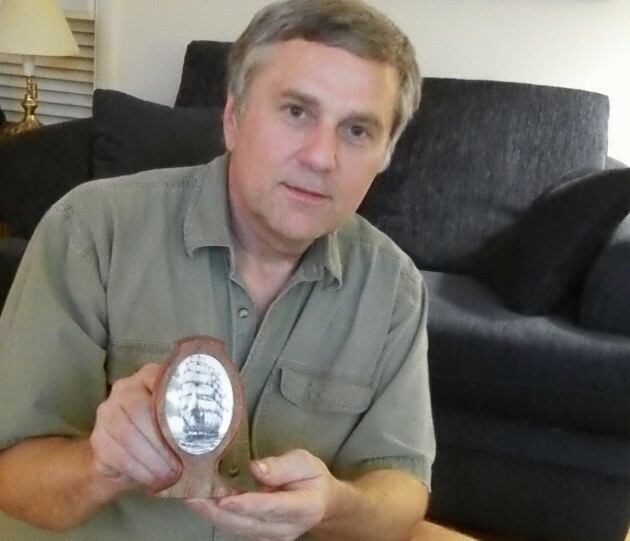 Kenn Holmes with one of the countless pieces of scrimshaw he has carved on legal ivory. Wednesday’s hearing on the ivory bill before the Oregon House Judiciary Committee generated so much testimony that the panel postponed action and scheduled another work session for May 27. Among all the submissions, the most compelling I saw came from Albany resident Kenn Holmes. Senate Bill 913, already passed by the Senate, would ban “trafficking in animal parts,” and by “parts” it means ivory from elephants and extinct mammoths, as well as rhinoceros horns. The committee heard from supporters of the bill including the Humane Society of the United States, the Oregon Zoo, an OSU professor and others who all stressed how important it is to protect African elephants from poachers. No one disagrees that killing elephants for their tusks is evil, but none of the bill’s supporters offered any concrete information on how banning the sale of ancient or legally imported ivory in Oregon would deter a single poacher. On Thursday Holmes told me a little about his work and showed me some of the pieces he has engraved. I was impressed by how much detail he could reproduce in the tiny space of a piece of ivory. And as far as I could tell, he would be unable to sell any of this work under the provisions of SB 913. I have been an unaffiliated voter for a long time, generally leaning towards Democratic candidates at the polls though. But this current session is just so very troubling. The gun transfer bill signed. Proposals to make it unlawful to travel in the left lane on I-5 are proposed (not passed yet I think, but the idea from a Portland Democrat that this is should be a law is the real issue). This ivory law which will do nothing to curb ivory poaching, and will yet again make criminals out of people who are simply going about their affairs. If this turns out to once again that the listening to citizens is a sham, as it it seems listening to the testimony on the gun bill was, then I will just feel like giving up hope. There have to be some reasonable Democrats left who can look at this bill logically, and vote on it based on its merits rather than on emotions. If it’s a party line vote yet again, then I may have to abandon my support for the Democratic party in Oregon. This is the friend I was referring to in my previous post. I urge all of you to contact not only your own Senator and Representative, but ALL State Senators and Representatives. If Mr. Holmes is to be made a “criminal” by this bill, the real crime will be by those who pass such legislation. Poached Ivory isn’t coming to the USA….it is going to other parts of the world, primarily Asia. This bill won’t save a single elephant or rhinoceros. I would also suggest our legislators busy themselves with important work, such as our failing infrastructure. The list of things we can’t do is getting longer than the list of things we can do……..and I’m getting sick of it. The following link contains the email addresses of each and every State Representative. I wrote each Representative by copying all their email addresses in the address box. This is an outrage and must be stopped. “Please note that all the legislators who supported the bill are all Democrats. They have the majority in the whole legislature and can pass anything they want to pass. The bill is now on the House side going through the process. If it is voted out of the House Judiciary Committee and sent to the House Floor for vote, I would say it stands a very good chance of passing if the Democrats want it to pass. I agree with everything you said in your email and find the bill very troubling. There just aren’t enough Republicans to stop the Democrats from passing bad legislation.” Bad legislation is putting it mildly. That sums up the situation we see in Salem on many legislative issues. One thing I know for sure….I will never vote for a Democrat again.